Chef Egg's kitchen can get crowded at times. His friends are always dropping off tasty treats, practicing their cooking skills and testing recipes. But, who is eating all of this grub? 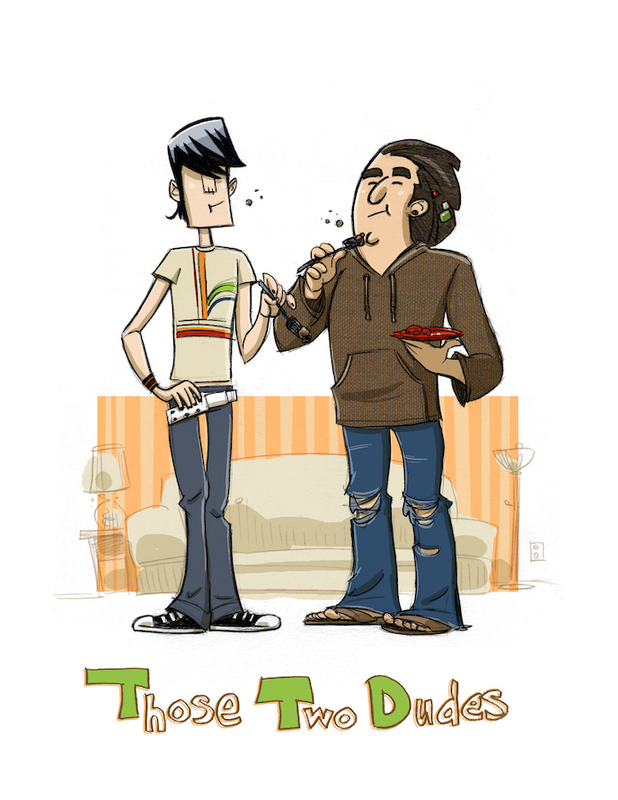 Well... Those Two Dudes! With bottomless stomachs, Those Two Dudes can eat everything in sight morning, noon and night. Where did Those Two Dudes come from? It all started when Chef Egg was teaching a cooking lesson at a local community college. Those Two Dudes came up to him for some samples and Chef Egg was blown away with the sheer amount of food these guys could put down. They also had crazy knowledge about FOOD! Everyone in Chef Egg's kitchen seems to like having Those Two Dudes around. They don't mind cleaning the dishes after a meal, are always willing to lend a hand, and they are a constant source of inspiration and humor. All who wish to sharpen their cooking skills with Chef Egg, must respect power of the blade. When Chef Egg gets near the razor's edge, Mac the Knife bursts onto the countertop with a sharp chop and swift kick. 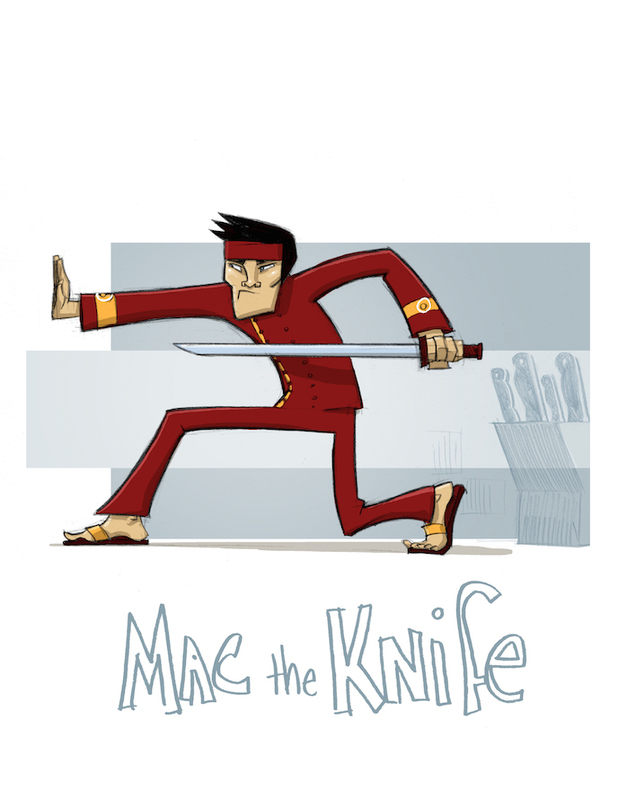 With a fierce stare and choppy subtitles, Mac calmly teaches about using knives safely. You must guide every slice. You must select the most supreme blade for the job. All great chefs must become a student of the knife. Follow the wisdom of Mac the Knife and you will find great success in Chef Egg's kitchen. Mac is soft and gentle soul who studied the martial arts on a mountain top temple in Japan. From a very young age he gravitated to the sharpened edges of the katana sword and then graduated to the larger Tachi sword. In Chef Egg's kitchen, Mac like to use a 8 inch Japanese steel chefs knife. Known for it's strength, sharp edge and all around utility, the chefs knife is a great tool for beginning cook of all ages and skills. Even though I am the Chef in my kitchen, I am certainly not the boss, for real. Meet the real captain of this ship, my friend Sally Sanitation. There are a lot of characters that roll through my kitchen. 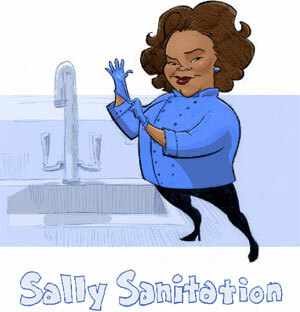 When somebody cuts up, that's when Sally Sanitation comes to life. A kitchen sink so big and bad that it's a good idea for everyone to keep it clean. Sally always lets Egg know that she better not see any germs. Everybody in the kitchen better wash up and cross-contamination better not cross her! Sally drop the hammer hard my friends. Sally passion for the kitchen started in her high school culinary program. After graduating college with a degree in food chemistry she went to work for as an inspector for the FDA while working on her higher education in food/nutrition public policy. With her PhD in hand, Sally is leading the way to make sure our food and water supply are clean and healthy for all to enjoy. How did Sally meet Chef Egg? Sally was walking through her local farmers market when saw Chef Egg performing a cooking demo. She saw the excitement that Chef Egg brought to the table and had to be involved with his mission. Sally has the perfect personality to teach about the importance of cleanliness and sanitation in the kitchen. She also has the authority to keep Chef Egg's kitchen crew in line. But in her off time, she enjoys watching her "stories" and enjoying a fresh glass of mango juice from Marley's garden. 1. Clean the dishes after your meal. I love to cook, but I hate to do the dishes. I know it is not a great way to end an evening, but try to make it a habit to clean the dishes after your meal. Sometimes it's hard, but it's important because you do not want a sticky dirty kitchen. Bugs and rodents love dirty kitchens. When hand washing dishes use hot water to clean the yuk from the dishes. Apply soapy water to sanitize the plate and rinse with clean hot water. Let the dishes dry in drying rack. Do not run the water full tilt and try to limit the water usage. If you have a dishwasher make sure that you wash on a full load. 2. Instead using toxic chemicals to clean your kitchen, make your own. Mix together 2 cups of white vinegar, a drop of liquid dish soap, 3 cups of water in a spray bottle and shake. The vinegar will kill germs, odors and bacteria and the dish soap will break down the grease. This is a cheap and effective way to clean the surfaces in your kitchen. 3. Clear the clutter - Remove mystery odors from your kitchen by keeping your fridge and pantry clean and organized. Throw away old food and condiments. If it's in your fridge and pantry and you have not used it in 6 months to a year, chuck it. Either its gone bad or you will never use it anyway. You will be surprised at what you find. 4. Reduce the amount of dishes you have to do by reducing the amount of dishes you have on your shelves. I had a problem where me and my roommates where doing a mass amount of dishes all of the time. The solution was to pick out the dishes we use the most and pack up the rest. We went from 20 plates, 30 cups and 100 pieces of mismatched utensils to 10 plates, 15 cups and mugs and 2 complete, matching sets of forks, knives and spoons. 5. Make Cleaning fun - No, for real, it can be done. First make a list of chores, this will keep you focused. Second, enlist your roommates and loved ones. The more hands you have working the faster it will get done. Third, rock out while you clean. If I may quote Madonna, "Get into the Groove". Choose funky and groovy tunes by artists like Michael Jackson, Stevie Wonder and even Lady Gaga. Also genres like old school hip hop and Motown classics and even 70's funk will really get you moving. Sing your song out loud, get your booty shaking and get your clean on!